I recently came across this article about the tipping point for ideas. If you get 10% of the population to become a true believer in any idea, that idea will shortly represent the majority opinion. To me, what this means is that at least 40% of people don't think for themselves, though the number is likely more on the order of 60-70%. In any case, regardless of whether these numbers are right, the idea that a minority of true believers can easily overtake the majority opinion makes for an interesting discussion. If you don't watch Dexter, you are seriously missing out. It is the best show on television right now, and this season of Dexter might be the best yet. 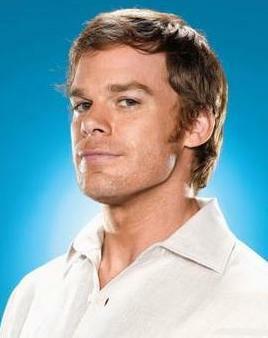 Dexter is about a serial killer who was identified as such by his cop father at a very early age. His dad Harry raised Dexter to become a vigilante serial killer, and taught him how to get away with it. Anyway, what's interesting about this season is that as Dexter brings his son Harrison up in the world, he has to make a decision about whether he wants to bring him up religious or not. Dexter pretty quickly rejects this notion, and this rejection is now being thoroughly reinforced throughout the season as one of the main plot lines involves a Bible thumping serial killer. The show is having a good versus evil battle where the atheist is the "good guy" and the religious zealot is the "bad guy." Even more interesting, they're both serial killers. And yet, we all root for Dexter, and are on firm moral footing in doing so. A recent episode of House had an interesting plotline as well, in this case it was self-interest versus altruism, with the altruist being painted as the bad guy (and eventually admitting that she was acting out of self-interest anyway). Add to that the fact that ancestral health is becoming mainstream with the Living Like a Caveman series and you have a trifecta of change coming down the pipeline. This change really cannot come soon enough, so all involved in the above examples must be praised. We have officially reached the "tipping point" of "true believers" in the scientific method. In this case though, it's not about being a "believer" so much as it is about being vocal and unapologetic about our ideas. In other words, skeptics have started puffing their chests a little more in an attempt to put an end to this idiocracy that we have evolved into. Now that skepticism is becoming a part of pop-culture, it will not be long before we see science as the majority opinion in all realms, the culmination of which will be an overtly atheist president and a repeal of many subsidies, including agricultural subsidies. Hmm. An overtly atheist president for the United States of America. . .? *Whistles. * Seems like a bit of a stretch since we have plenty of believers, non-believers, thumpers, and other assorted [insert belief concept here] types who take exception to subsidies. At the end of the day, culture seems to prevail over any personal belief. It's just that in the case of certain countries, certain religious beliefs are the very foundation of their culture. I don't know man. 90% of America right now believes in the Christian man-in-the-sky. If this change is comIng, it's coming very slowly. You have to remember that educated people live in a bubble. That number is reversed for scientists; something like 97% are atheist or agnostic. There's also the cultural aspect. Most Christians I know arent religious but rather just Politically correct. Most people would ask what else is there? Without god how can you have morals, etc? The answer is obvious to us but not so to them. I think humanism or zen Buddhism have a stronger chance of tipping than atheism because they have a stronger message and a sort of culture behind them. I really enjoy that show Dexter, and the story line where he questions religion is very interesting and how it all plays out on his reasoning behing his murders.